As the government offers a re-run of the asylum seeker scare campaign of 2001, News Corp run through the other classics. 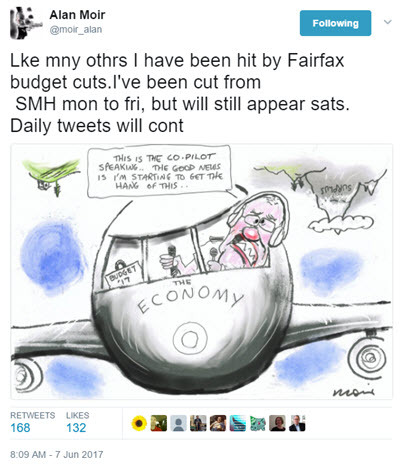 As Fairfax loses its purpose, how long will print survive? After Nine's takeover of Fairfax, it will be a question of when, not if, the major mastheads will cease to print the dailies. The Checkout, ABC's consumer affairs show, has fallen victim to the ABC's funding cuts. The Australian Press Council has found The Sydney Morning Herald in breach of privacy for a story about a murder case. The ABC has bumped its male talent off air for International Women's Day. Plus other media tidbits of the day. Why do newspapers now literally wrap themselves in ads? In newspapers' heyday, they would never have dreamed of selling front pages to advertisers. But we're seeing it more and more for one reason: Money. Is there something particular about the media industry that makes people more susceptible for mental health problems, and is it worse than others at dealing with mental health issues? 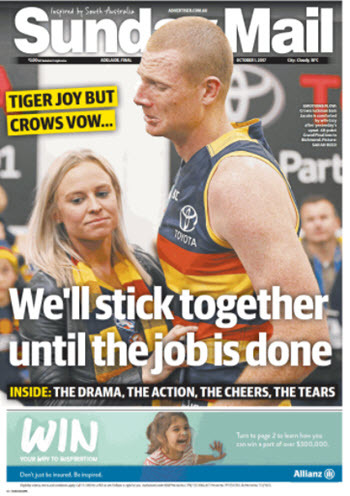 Headline writers at Melbourne's two papers must have thought they had the perfect pun for Richmond's Saturday grand final win. Alan Stokes, Rohan Connolly and Adam Morton are among big names to be leaving Fairfax, with decades of experience walking out the door in the latest round of redundancies.